CHICKEN CAESAR SALAD PIZZA — NORTHERN DOUGH CO. Always tell yourself you’ll ‘try something new’ but end up ordering your comfort food favourite when you eat out? 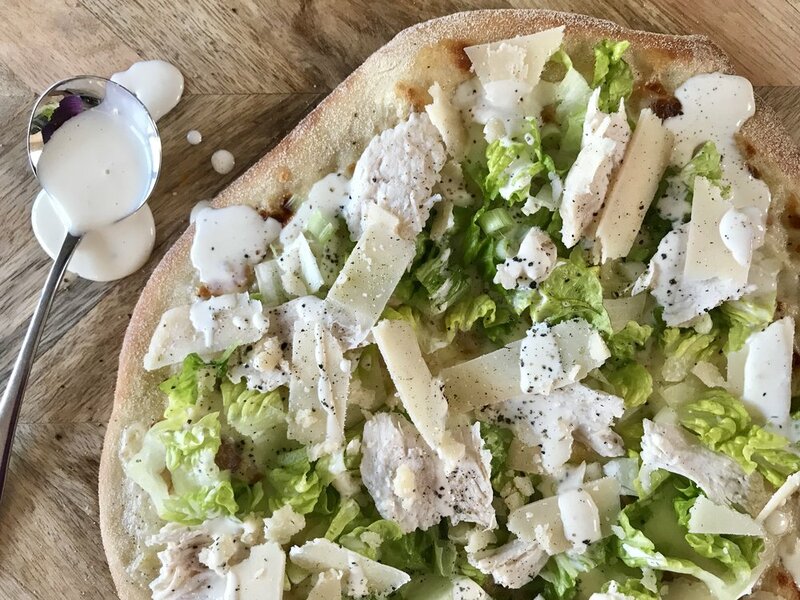 We’ve created a pizza-take on the classic chicken Caesar salad with this pretty special pizza recipe, try it and it’ll soon be your new favourite meal at home. Pre-heat your oven to its hottest setting, and lightly flour your worksurface, rolling pin (if using) and baking tray. Roll or stretch your dough to approx. 10-12 inches in diameter (this will give you a classic Neapolitan style thin and crispy pizza. Move your pizza base to the lightly floured baking tray, spread evenly with carbonara sauce, then move to the hot oven for 6-8 mins, your pizza will be cooked when the crust has turned golden brown and the toppings are bubbling. Allow to cool slightly then pile up the lettuce, chicken and Parmesan then drizzle with the dressing, crack some black pepper and enjoy!